The dissemination of the project stages and results will take several forms and use a variety of media. All the items will have a common layout and will promote the Erasmus+ programme and its values. 1. Project website The project website is one of the main sources of information about the project. The website has been established immediately at the start of the project and will be maintained for at least two year after the project ends. It has been designed to be informative and easy to use to ensure wide communication with young people, stakeholders and external audience. It will contain all the materials as well as other dissemination and communication items. The project website will be multilingual in its most relevant sections. It will be in English, Italian, Turkish and Spanish. 2. Labs in youth centres One important activity of dissemination, preceding the multiplier events phase, are the labs in youth centres. The partnership has set the goal to promote the IO1 through labs in youth centres to implement a capillary action on the local area. Partners will be responsible to carry out labs in youth centres , involving a total amount of 100 youth workers. 3. Social media Due to its objectives, to its target and to the public the project intends to achieve, the partnership believes that social media are a tool of great use in this context. The project will be disseminated through Facebook and Instagram. 4.Free cards (10.000 printed free cards) The project will be disseminated through free card as well. It will be distributed to the youth centres. All the partners will provide to distribute them. 5. Personal communications Another tool to disseminate the project will be the e-mail/telephone. The e-mails will be used to inform stakeholders about project events, results and activities. 6. Newsletter The partnership will produce a newsletters to highlight results and activities. Each partner will be in charge at least of one newsletter implementation. 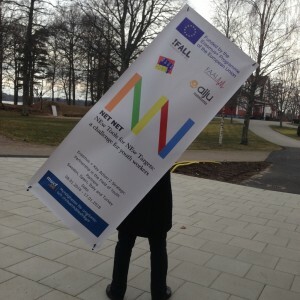 Each organisation will print a roll up banner on the model used for the first transnational meeting.